SHANGHAI - China's booming interest in the wine industry is set to get another boost thanks to the sprinkling of a little stardust. The first batch of wine known as Yao Ming 2009 Napa Valley Cabernet Sauvignon from the former basketball player's own Napa Valley wine company is ready at 3,800 yuan a magnum - but none of the 1,200 bottles of wine will be sold on the open market. Yao, who retired from the professional court in July 2011, announced the debut of Yao Ming Wine on Nov 23, 2011, along with his Napa Valley wine company, Yao Family Wines. He is not the only celebrity in China targeting the booming red wine market. Ding Lei, the founder and chief executive officer of Netease, invested in H&L Wine in Zhejiang province in June 2011. The wine trading company aims to trade imported wine from France at prices ranging from 100 yuan ($16) to thousands of yuan. The company has set up offices in several large cities including Shanghai and Guangzhou. Netease said for Ding the investment is a personal hobby and not part of the company's business. Zhao Wei, a Chinese movie star sometimes known by her English name Vicki Zhao, is reportedly buying a winery in France worth some 4 million euros. It is said she might sell the wine in China. Experts said celebrities investing in wine businesses are hoping to generate profits from the exuberant Chinese market. 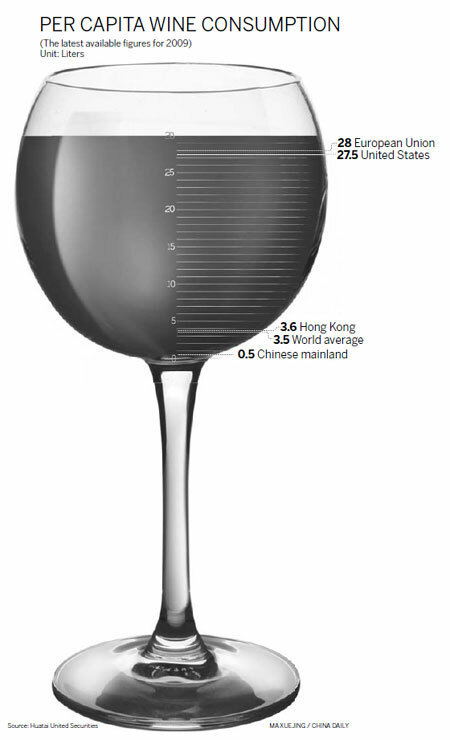 Media reports say wine consumption per capita in China was 500 mililiters in 2009 and 950 mililiters in 2010, much lower than the world average. They predict tremendous potential for increasing wine sales across the country. Figures from A.T. Kearney (ATK), a consulting firm in the United States, suggest that revenue generated from wine sales in China reached about 53 billion yuan in 2009, benefiting from increasing wine awareness and rising health consciousness. ATK said growth in both volume and value has been 15 percent or better on an annual basis over the past few years. Howard Abe, who specializes in consumer goods and retail practice at ATK, said the red wine business in China has a bright outlook with a compound annual growth rate of 12.2 percent from 2010 to 2015. "Limited investment channels and a bearish stock market encourage the Chinese to seek different investments such as in gold or silver. Investing in wine involves long storage periods and represents a certain type of lifestyle so it has become a popular investment among the wealthy classes," said Shu Guohua, a marketing expert in China. Shu said it is also a way for celebrities such as Yao to maintain public awareness and commercial value after retirement. Some experts said Yao's wine might not be available in traditional open markets and will only be distributed among higher-end consumers. Compared with other well-known imported wines, it will be easy for Yao to establish brand awareness. However, experts warn that celebrities need to pay attention to the quality of wine to maintain custom and establish a good reputation. "For Yao Ming, it was a good marketing strategy to create his own-brand wine. However, it will take a long time for customers to recognize the intrinsic value of the wine and believe it is worthwhile buying," said Shu. "As a Chinese person, I think it will be better for Yao to invest in white liquor. The market demand for white liquor in China is much larger than for red wine.